Louisiana State University (LSU), a school known for its fans’ devotion to attending football games, recently renovated the club level suites in their historic stadium built in 1924. The club suites provide private seating and superior amenities for guests at the stadium. Due to the higher ticket prices in these suites, the university strives to maintain a high level of comfort and a premium experience for guests. Because the suites were located directly above poorly insulated cast concrete public corridors, they experienced extreme temperature variations. The concrete trapped excessive heat in Baton Rouge’s hot summer and fall months, which led football fans across the country to refer to Tiger Stadium as “Death Valley.” In the late fall and winter, the concrete corridors were cold, making the suites above uncomfortable. In July 2018, LSU determined it was time to increase the level of insulation in its club suites to combat these issues. The university hired local insulation specialist Calmar Corporation to select and install the most appropriate insulation for the stadium’s concrete corridor ceilings, which sit underneath the club suites. Initially, the company considered using spray foam insulation, but quickly realized that this wasn’t an aesthetically pleasing choice for an area of high visibility. Instead, Calmar determined they needed a manufacturer who would provide an aesthetically pleasing exterior continuous insulation that ensures long-term energy efficiency. 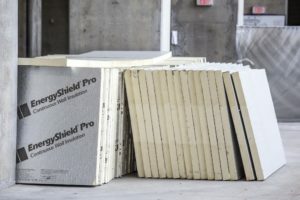 With more than 30 years of industry expertise in polyiso manufacturing and proven building envelope performance, Atlas EnergyShield® Pro became the ideal choice. Atlas EnergyShield Pro provides an effective layer of insulation for thermal, air, moisture and vapor control. Calmar installed 3-inches of Atlas EnergyShield Pro continuous insulation on the ceilings. The panels provide an R-Value of 19.7, making it the most energy-efficient solution the contractor reviewed. Its durable aluminum facers and water-resistive barrier capability result in a high-performance rigid insulation, and its Class-A fire resistance properties were a logical choice for a public space that prioritizes public safety. 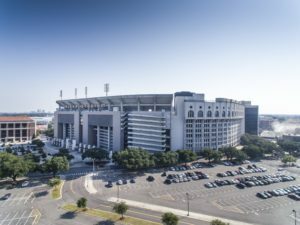 While designed to be used as an exterior continuous insulation, EnergyShield Pro also works well for interior ceilings where a smooth structure and clean appearance are desirable, as was the case at the LSU stadium. Calmar painted the panels and fasteners gray to match the concrete walls of the corridors; the insulation was then installed to the ceiling over a period of 30 days. This autumn, football fans returned en masse to LSU’s stadium, which touted newly renovated club suites. Thanks to Atlas EnergyShield Pro, the suites’ flooring now upholds a high R-Value, improving temperature control and keeping guests comfortable during both the intense summer heat and colder fall months. The concrete structure now offers an improved insulation, moisture and air barrier, providing the university with a long-term investment in insulation that made this remodeling cost-effective. With benefits not limited to club suite guests, all visitors walking through the corridors underneath the suites experience a streamlined insulation system that blends in nicely with the existing concrete structure.